An artist''s impression of Dandenong Stadium. 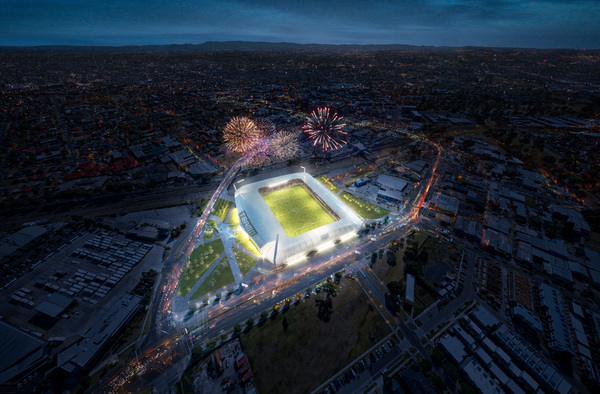 Dandenong Stadium is a winner with most of the public – except for some living closest to the proposed A-League venue. The $150 million stadium to be built at Cheltenham and George streets won a 74 per cent approval rating from 184 survey respondents, according to a Greater Dandenong Council community consultation. Many stated they were likely to attend the stadium, which is hoped to host a South-East A-League side from 2019-20. However, 56 per cent of 65 local resident ‘feedback forms’ opposed the stadium. Those in favour raved about the boost to Dandenong’s profile, jobs and community cohesion, as well as its proximity to Dandenong railway station. Those against were concerned about the use of ratepayers funds, insufficient parking, traffic congestion and noise and amenity issues for residents near the stadium. A council report on the consultation stated that parking and traffic management would have to be “carefully considered” in the stadium’s design. Noise, safety and amenity issues in nearby residential areas would also need to be taken into account. Councillor Jim Memeti said overall, the results were a strong endorsement of the stadium. He said parking would be catered for by central Dandenong’s multi-level car parks, otherwise empty on Saturday nights. Most residents were supportive of the stadium, with Cheltenham Road creating a large buffer from the housing estates in the south. The stadium is contingent on Team 11 winning an A-League licence, as well as state and federal funding. The A-League licence bid is expected to be decided by Football Federation Australia soon after a 12 December board meeting.